"The thunder rolled, and with it a man appeared, riding on a pale horse. And the riders name was Trump. From his mouth came a sword. Was it a sword of righteousness or a sword of death? Nobody knows. Would he smite the Philistines or his own people? Nobody knows that, either. Would he bring the people of God back to their knees? And if he did, would he bless them, or would he cut off their heads? How the hell should I know? But I do know this, I'm gonna have a lot of fun as people rush to judgement, declaring "The end is Nigh!" Because, when things are nigh, it's probably not good. Why else would they use a term like "Nigh?" Yes, Trump Derangement Syndrome (TDS) is officially upon us...and it is nigh!" When did Donald Trump change and become a conservative? Who really knows. But let me offer a timely demarcation line for the transformation. In the early stages of the Obama presidency, Trump was an Obama supporter, and he stated this openly. But, by the end of Obama's first term, the worm...er....the Trump had turned. How do I know this? Because he was outspoken about his offer of one million smackeroos to Obama's favorite charity if the prez could produce a legit birth certificate. (Does that make Trump a birther?) The Donald's affection for Obama had clearly tanked, right in keeping with the country's downward spiral, which was evident to anyone with a smattering of economic savvy, at least among those who hadn't drunk the kool-aide. I realize it's becoming fashionable for folks on both sides of the aisle to say that The Donald's vaunted business acumen is a fabrication. After all, his pops gave him a cool million to invest when he was a young man. Hell, with a cool million, who couldn't turn it into ten billion or so of net worth! Yep, I bet just about everybody who's ever been given a gift of one thousand dollars probably turned right around and invested it and made a million or more dollars from it. Which, by the way, would be the equivalent. Yeah, I know, The Donald inherited a lot of dough from his dad in 1999 (about $250,000,000 split between him and three other siblings) but the Donald was already wealthy long before that, big time, in fact. Trump did go through a few trying years in the early 90's but saw a financial revitalization and even greater wealth creation afterward and currently owns millions of square feet of prime Manhattan real estate. Of course, there's still those four bankruptcies. Apparently, some people see them as four personal bankruptcies. Let's face it, that would be a whole shitload of bankruptcies. But that's not what were talking about. If you're an investor in 100's business, you will establish different corporations, with different corporate names for each one. Everybody does this. So, four bankruptcies out of hundreds of business endeavors is not the same thing. It's not even close. That isn't an excuse, it's simply the fact. 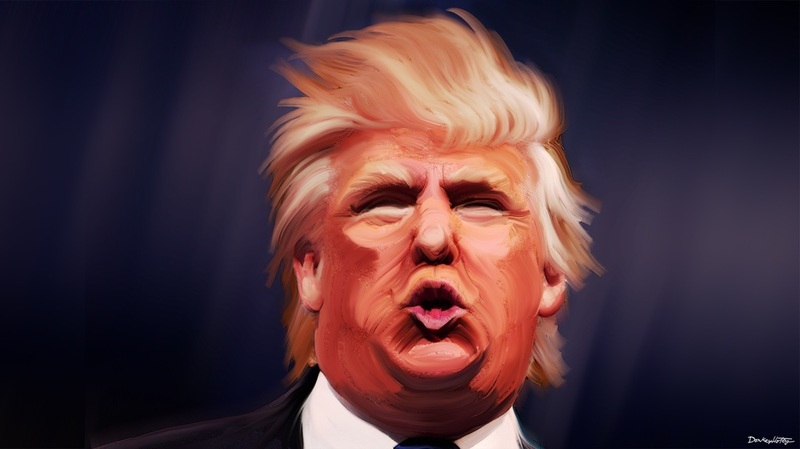 ​So, is the Donald an authentic conservative? Has there been an authentic conservative near the Oval office since Ronald Reagan? (Ted Cruz could be the exception.) Leading me to conclude what? That I'd vote for The Macho Man Randy Savage (Who happens to be dead) before I'd vote for Hillary or Bernie. You betcha. And it sure as hell isn't because I love the rich and hate the poor. Unless we're talking about a self-inflicted and willful poverty of the mind, which there is, in an abundance, in these here United States. Then yes, my hatred runs deep.